Im about to have a spot of welding done directly under the sliding window in the back (drivers side of my) Camper. Has anyone removed the sliding window and frame before? but before I go at it with some tools and break the - oh so rare window unit I thought I would ask you all. Im presuming a the window itself is Hiace specific and not available anywhere as a spare case hit breaks during the fitting /replacement..? Well, I will monitor this, since this will soon be done to our van as well. I think it is a metal frame indeed, like most sliding windows. My mechanic thought it wasn't much of a big deal to get the windows out. But I would also get nervous to do it myself. All new and original Toyota, just lying around unused in stock probably for several years. If some donkey were to break into my van by window smashing what should I do to get that window in North America? Well I guess as our lovely vans become more "classic" its a worry, not just for the windows! Anyone ever tried to get sun visors that fit?! Im not sure how much there are in Canada, that there will be enough wreckers over there. I think best chance is to source something from Europe or Australia, with quite some shipping cost involved. But you have some universal rear windows I think, they may have some brand in it. I think you guys dont realize they still produce these vans new in China! Jinbei Hiace. What kind of sun visor do you mean? The flip down, just above your eyeline, sometimes has a mirror type. Mine are super tatty and torn, but even stock Toyota ones are the incorrect width. Need to drill into the metal to fit new ones, but recarpeted cab recently so reluctant! For the smaller sliding windows I'd think they'd be replaceable without too much trouble with polycarbonate as long as the plastic was strong enough. Normal glass can't be used due to safety, so it's original or poly IMO. As for the sun visor, Mr Style who added bits to mine before I bought it had a big sun visor - simply a bit of tinted 3mm polycarbonate shaped to the top of the screen, slipped into the stop next to the rubbers and a small rubber bung from the mirror to hold the centre. You really just need to cut out an accurate template that fits for you (and is shallow enough to not block out too much of the view up! - probably 3" max) and slot it into place. If you want to pop by here you can even draw around mine, as it's out at the moment as I need to make it less tall as I'm taller than the chap who fitted it. I'm sure there's also stick on film too - or even that soft 'static' film perhaps. I thought the side windows were flat, but upon inspection I realise that they have a slight curve to them so while flat ones could be fitted as a temporary measure with a bit of tension to hold them in top and bottom I think original windows are indeed required. Ohhh..... very intersting.... Jinbei Haise. 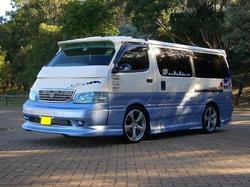 I read they are still producing 4th gen hiace replicas... so maybe chinese windows eh.. interesting. I read in a copy of MMM magazine (well worth a read now and again) about a couple that had all their windows replaced (as they'd picked up a wreck) in an old Winnebago and just had a glass guy come out and cut them to size. As long as it's the reinforced type glass they should be able to be cut to size no problem. Did a quick google search and there are quite a few companies out there that can do it. I've just noticed Mr Style. Made me chuckle. Cutting to size is not a problem at all. But there is a slight bend in the glass that makes it difficult. That means you will need to look at plastic kind of windows like GPW was already suggesting. Anyway, I now have a complete set of sliding windows from this guy I was mentioning, of which the rear windows are being replaced as we speak. I hope they fit well.. Because I don't think they are completely original as I was thinking. Anyway, they look okay. Important note though: The front side windows (so at the sliding doors) can be different. If the window is supposed to go into a side where there is no sliding door, it is longer! From what it looks like right now, the height is in fact the same, as is the rounding on the end, so you could actually use the glass (but not the frame, or have someone shorten the frame). The glass would then be too long, but only like 5cm or so. And to replace the glass in the sliding frame, I think the frame must come out first. And you cannot use windows (frame and/or glass) from the left side on the right side as the shape is different. Ok, so use a heat gun to heat up the interior rubber seal a little and some some wooden pegs to place in between the vehicle body and the seal as you prize it off all the way round... carefully. The whole sliding window is simply held in place by the seal. no clips, or screws. The seal is part of the unit. Just make sure there is something/someone the other side as you push it out! Yeah my mechanic mentioned something about pulling a rope symmetrical along both sides while you push it in. Because I think you will want to put it back in. Anyway, don't press to hard, and indeed you need a second person. I just had my rear windows replaced with the sliding ones, and also some rust repair on the left rear side. I was surprised to learn that these sliding window frames go in without clips or screws, but also without any glue. Not sure how that is for the normal windows. Old windows, and windscreens were all rubber sealed in. Modern windows are bonded in. With a bonded windscreen replacement (for example) you have to wait quite a bit for the glue, or whatever they use, to set. The old rubber seal ones you replace and you're allowed to drive off immediately. Where did you source your rear sliding windows Hiace4wd? Would quite like one of the back of my van (on the sliding door side). Can you give a bit mor detail on the first part of this process? "Ok, so use a heat gun to heat up the interior rubber seal a little and some some wooden pegs to place in between the vehicle body and the seal as you prize it off all the way round... carefully." Mine is going to have a bit of welding under both offside sliding windows. The bodyshop guy was wondering if he had to call in a windscreen company to take the glass out and put it back later. No, no need for any windscreen folk at all its like a ten min job per window. Its really very easy once you get your head round it. The window, the whole unit is sitting on the outside of the van. simply holding the window in place, gripping the van - all the way round. On mine, no clips, glue, pins - nothing! So, when i said pegs, i meant clothes pegs. Wooden ones. Remove the spring, then in a corner just start prizing the seal off. Stick in a peg and move on, to stop the rubber from regripping. Just like tyre levers on a stubborn bicycle tyre. the entire window and seals will push OUT, thats OUT of the van. So make sure you have help on the other side to catch the irreplaceable precious thing. Heat gun just to keep things flexible. I did mine in the spring, no dramas. To put back in, just edge the sealback aound the metal work and over your cloth. Removing the complete sliding window unit is very simple as mentioned above , however once out how do you remove the glass from the frame I’ve been looking at mine for two days with no luck at solving this crazy puzzle I’m sure I’m missing something simple haha but I’m stumped, could anyone shine some light on this?